Every June, my local paper is filled with the local private school announcements containing lists and lists and lists of where students have been accepted to. With all the private schools competing with each other to showcase college acceptances for that year, creating a map showing the locations of colleges and universities that have accepted students from a specific school is a great way to stand out. Radial flow maps show great-circle distance, which is the shortest distance between any two points on the earth. Maps with great-circle distances are commonly found on airline route maps but they can be used to show any movement from one point on earth to another. For this process, I obtained a list of all the colleges that students from the secondary school had been accepted to. An easy way to geocode is based on the name of the school using a landmark layer. I used the free geocoding service from Batchgeo and simply dropped the list of schools into its geocoding application and then downloaded the KML produced. I then used the To KML tool found within the Conversion Toolbox in ArcGIS to convert the KML to a Geodatabase for use within ArcGIS. For more detail on this process, read the article I’ve written called Geocoding Shortcut: Google Maps to ArcMap. Once the geocoded locations of both the originating secondary school and the list of colleges have been imported into ArcGIS, the creation of the radial flow lines can begin. 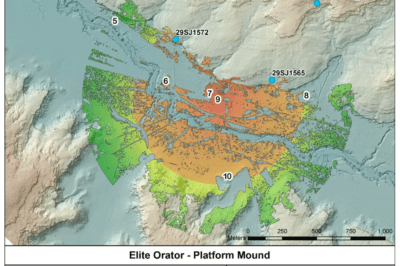 ArcGIS has an XY to Line tool that can easily create radial lines and the ArcGIS Resource Center has a post describing the process. To do that, a table with two sets of X,Y coordinates first needs to be created. One set of X,Y coordinates for the from location (which in this case is the school) and one set of X,Y coordinates for the to location; the list of colleges and universities. 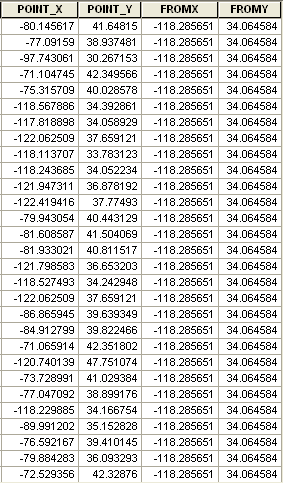 To create this table, I extracted the XY coordinates from both a shapefile containing the single location of the school and the Geodatabase I created of the college locations. 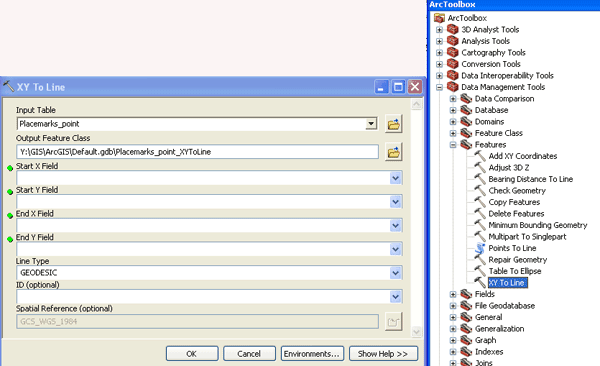 Using the Add XY Coordinates tool from the Data Management Tools toolbox –> Features toolset, the coordinate information was added to each dataset. I then created a table that contain four columns of coordinates: the first two columns contained an identical list of X,Y coordinates for each records as the from coordinates of the secondary school, the second set of X,Y coordinates represent the to coordinates of the college location. If you want to attached additional information to the generated radial flow lines, add those columns to your table. The minimum information need for the Add XY coordinates process in ArcGIS are the four fields containing the two sets of X,Y coordinates. The next step is to create the radial flow lines by accessing the XY to Line tool which is located in the Data Management Toolbox > Features Toolset. I selected the Geodesic line type option which creates a straight line based on a spheroid. 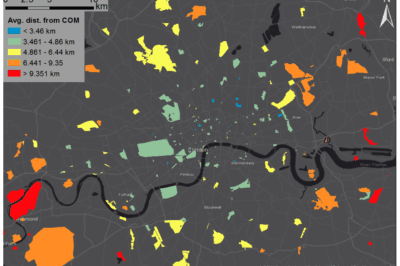 Running the process will produce a shapefile of lines that originate at the secondary school and end at the location of each college within the table. 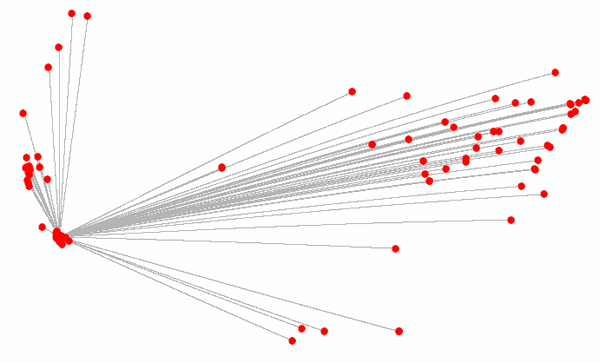 Radial flow lines from the secondary school to the list of colleges (red points). Now that all of the main geographic components have been created, it’s time to pull everything together into a map to tell the story of this school’s higher education successes. Since the focus of the map is the location of colleges and universities that have accepted this school’s graduating class, I chose a neutral base map which wouldn’t compete with the locations and flow lines. Rather than spend time creating my own base layers, I quickly loaded in the World Terrain basemap supplied by Esri from ArcGIS online. This neutral basemap contains terrain shading to add visual interest; the topographic perspective also provides an orientation perspective of the United States. On top of that layer, I added state boundary lines with a double layer of a thicker white border with a thinner gray border on top, again for orientation purposes. I also kept the radial flow lines gray but in a darker shade so that they were visible to the viewer but didn’t cloud the college locations. Since the lines created by the radial flow map impart a sense of movement using them on the map provides the message: attend our school and your child will be going places! The college locations were added in a brilliant red hue so that they popped against the neutral gray background as well as invoking the red found prominently in the school’s logo. Since the colleges were clustered in many regions, labeling based on a unique number ID was used to reduce the need to fine tune overlapping labels. Inset maps were created for two areas of higher density that would otherwise not be distinguishable at the overall scale of the map (northern and southern California). Last, I added in the list of colleges, ranked by the label ID as a reference table to the map layout. 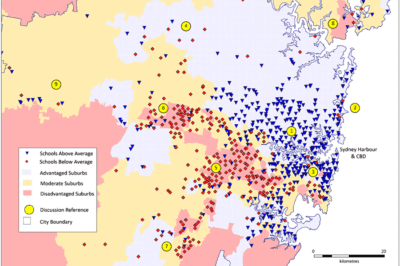 The resulting map is a more visualizing attractive method for a secondary school to showcase its college acceptances as compared to a simple list. A side benefit is the simple understanding of the geographic distribution of where a school’s students apply and are accepted. Being a Los Angeles area school, it’s of no surprise that a significant number of colleges are located in Southern and Northern California. A scattering of colleges are also located along the West Coast and in southern Texas and New Orleans. The Midwest and Northeast regions of the United States are also favored heavily. Map of college acceptances. Click on the image for a higher resolution PDF of the map. 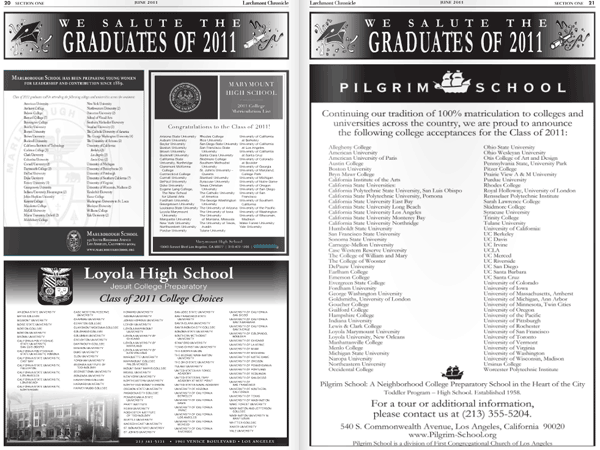 College acceptance lists in the local paper.